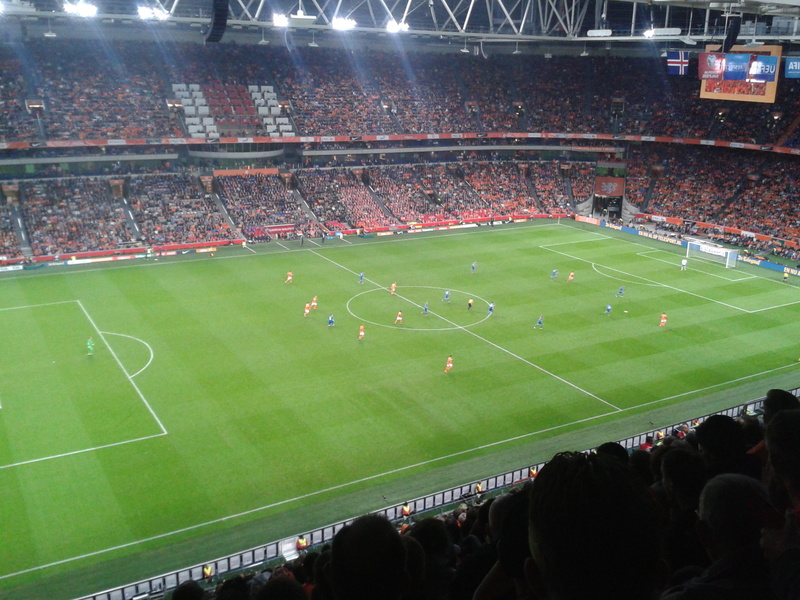 Iceland's match away to the Netherlands at the Amsterdam ArenA in Euro 2016 qualifying group A on 03/09/15 was an important one in all sorts of ways; for the hosts, victory was imperative if they were to keep their hopes of at least reaching the play-offs for France. For Iceland, a win would bring them one step closer to creating history. No Icelandic team had ever qualified for the final stages of a major competition, although this one had come close just under two years ago, when they lost to Croatia in the play-offs over two legs. Going into the match, they were two points ahead of the Czech Republic, who were due to play Kazakhstan in Prague the same evening. 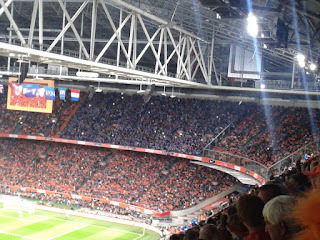 Before kick-off, several of the 3000 Icelandic supporters who had come to Holland for the fixture - and the dozens of Icelandophiles who had come to Amsterdam to lend their support - were sceptical of their team's chances of gaining all three points, but were hopeful of watching their team come away with a draw. After all, Iceland had beaten Oranje for the very first time in eleven attempts in their 2:0 win in October last year, so a point in the return match would come in very handy in their attempt to qualify for Euro 2016. The game itself started with the Dutch very much on the front foot, with Wesley Sneijder the focal point for much of the attacking early on, but it was Iceland's Johann Gudmundsson who had the game's first real shot on goal after seven minutes. A cross from Gylfi Sigurdsson found Gudmundsson in space five yards out from the right-hand post, but he scooped the ball back across goal and wide. Iceland began to come more into the game after this, but Arjen Robben, Memphis Depay ("Memphis") and Wesley Sneijder all had chances in quick succession, with Robben also firing a 20-yard free-kick just wide of Hannes Halldórsson's left-hand post. 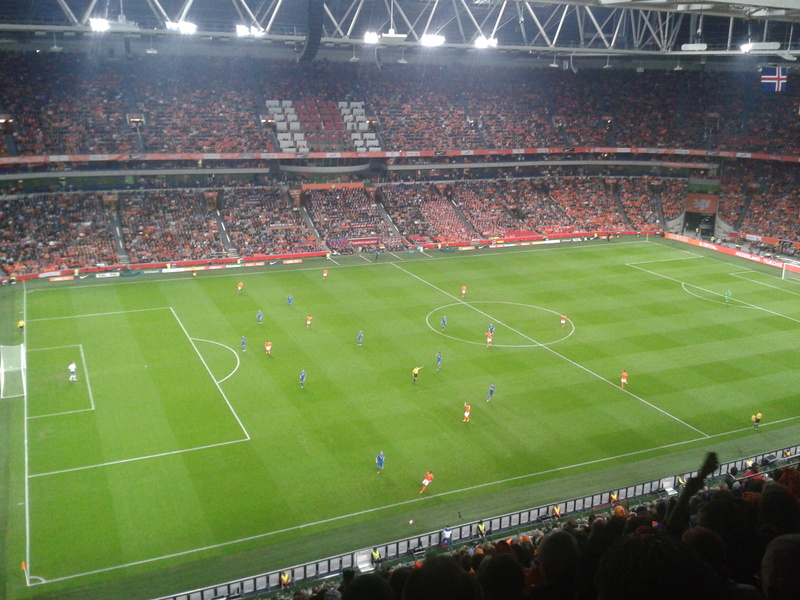 The Dutch dominated the first 25 minutes or so, but Iceland were coping well with the pressure, which was mainly coming from the flanks via Robben and Depay, whilst the visitors were mostly working through the middle, with Birkir Bjarnason working his socks off on behalf of his team. Depay had a chance to line up a shot from the edge of the Iceland penalty-area after 27 minutes, but dithered and eventually lost the ball. 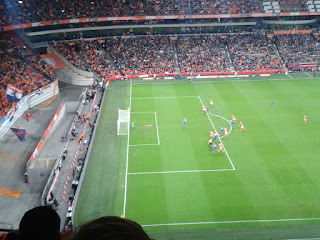 Sneijder's dangerous 29th-minute cross was only just missed by both Depay and Klaas-Jan Huntelaar. Things then began to unravel for the hosts in the space of just a few minutes just after the half-hour mark. First the ever-dangerous (and ever injury-prone) Arjen Robben hobbled off with an ankle injury and was replaced by Luciano Narsingh, and then Bruno Martins Indi received a straight red card in the 33rd minute for a rush of blood to the head. He had been clipped from behind by Kolbeinn Sigþórsson, and as both players fell over each other onto the ground, Martins Indi lashed out with his forearm, catching Sigþórsson on the neck, and all this right in front of the linesman on the near side. Holland had lost their best player and were now also a man down, but still they pressed, with Memphis Depay assuming more responsibility; he sent over a dangerous-looking cross that evaded both defenders and attackers, and then sent in a low free-kick which was spilled by Halldórsson but the ball was cleared by a defender. 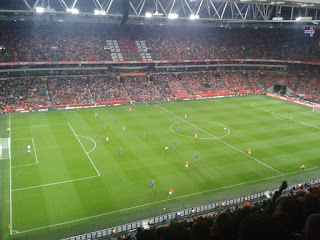 Huntelaar was seeing very little of the action, and Dutch manager Danny Blind replaced him with Jeffrey Bruma as the first half drew to a close. 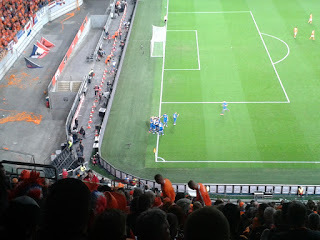 Sneijder had another go from long range just before half-time, but his shot was easily saved by Halldórsson. Sneijder's effort was indicative of the first half, with the Dutch pressurising and having a fair number of shots on goal, but they did not unduly trouble the Icelandic defence and most of the few shots they had on target were no trouble for Halldórsson. Iceland began the second half in attacking mode, and Johann Gudmundsson's work on the right led to a pass inside to Ári Skúlason, but his 25-yard shot flew to the right of Jasper Cillessen and his goal. The visitors kept up the pressure, and Bjarnason and Sigurdsson were at the heart of it. After a receiving knockdown from Sigþórsson inside the Dutch box in the 51st minute, Bjarnason advanced towards the goal-line but was tripped by the lunging Gregory van der Wiel some ten yards out; watching the incident take place, it was as if it had happened in slow motion but it was a definite penalty. 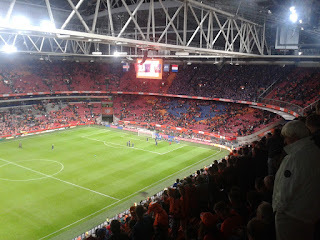 Both Dutch players and fans howled to high heaven, but to no avail; Serbian referee Milorad Mazic pointed to the spot and had got his second contentious decision of the evening just as spot-on as he had his first (Martins Indi's red card). Before the match, Gylfi Sugurdsson was the (almost) unanimous choice amongst the Icelandic faithful as the man most likely to carry their team to qualification for Euro 2016, and he did not let them down. His penalty, low and to the right of Cillessen, although probably not the best he has ever taken, was good enough to put Iceland in front, despite the 'keeper getting both hands to the ball. Bjarnason was involved in the next move of note three minutes later; he collected a cross-field pass inside the Dutch penalty-area, held up the ball, passed it back to Gudmundsson, whose deftly curled effort from 20 yards smacked off the upright with Cillesen beaten. Sigþórsson skewered the rebound wide under pressure from a defender. The Dutch cranked up the pressure again, with Sneijder's low shot again proving no problem for Halldórsson; the Icelandic goalkeeper had to be a little more alert moments later when he dealt well with a curling shot from Depay. Sigþórsson was substituted in the 64th minute by Eiður Gudjohnsen as Holland kept attempting to breach the Icelandic defence but were abjectly unsuccessful; the vast majority of their shots on goal were from outside the penalty-area. Gylfi Sigurdsson is mobbed by his team-mates after putting Iceland in front..
Narsingh was doing his best to bring something fresh to the home team's approach by going on a run, cutting in and shooting from distance, but the ball went wide of the right-hand post. He took matters into his own hands again in the 69th minutes when a couple of his team-mates had chances to shoot, but didn't; however, his shot from the edge of the area went wide. Almost immediately, the boys in blue darted down the other end, and Cillesen had to be at his acrobatic best twice within the space of a few seconds; he denied first Gudmundsson and then Sigurdsson with two flying saves to parry away stinging shots from outside the box. The second resulted in a corner which was met by Gudjohnsen, who sent his half-volley well over the bar. Bjarnason and Gudjohnsen combined to set up a chance for Gudmundsson with fifteen minutes left, but the latter's half-volley from the right-hand side careered across the area and wide. Depay continued to be the most likely of the Dutch players to find the key to unlock the visitors' defence, but even he was suffering from "hit-and-hope" syndrome; Narsingh set him up as the game entered the last ten minutes of normal time, but the Manchester United man's shot was tame. 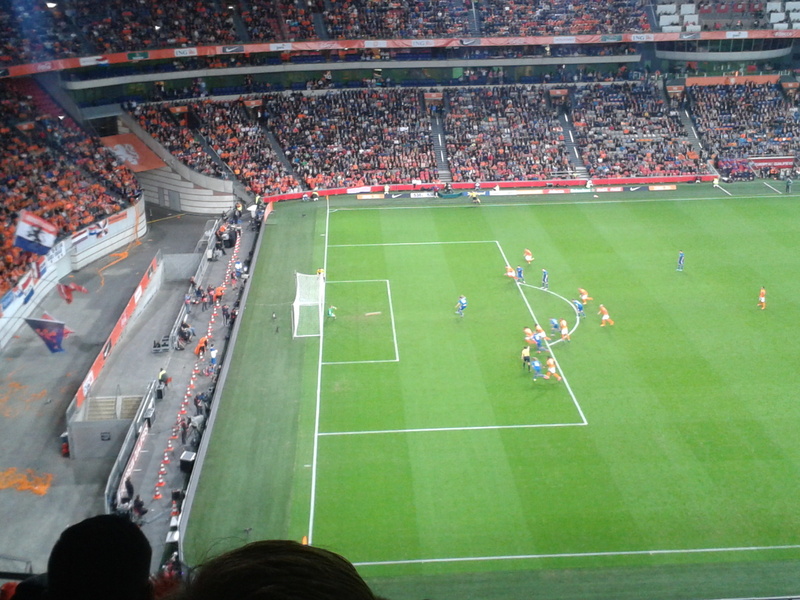 Wesley Sneijder at last tested Halldórsson with a low shot from distance, to which the 'keeper was able to get his fingertips and divert it away for a corner. He had another go with a low shot in the 88th minute, this time from actually inside the area, but Halldórsson got to it, albeit with some difficulty. Three minutes of injury-time should have signalled a cavalry charge from, and a shot at salvation for, Oranje, but the best they could do was fashion another chance for Sneijder, whose snapshot from 20 yards or so simply hadn't enough power to worry Halldórsson. With that ended the game as a contest, if one could call it that, and upon the final whistle which followed a minute or so later, the 3000 Icelandic fans who made the trip to the ArenA and had supported their team vociferously from the off cranked up the decibel level still further. 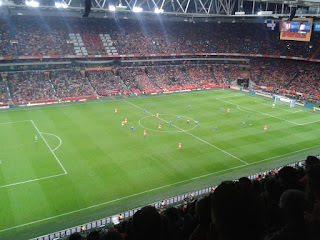 Sneijder's final attempt on goal was typical of the Dutch team's evening; they just didn't have enough power in the front-line, nor did they have the invention needed to unlock the Icelandic defence, which had come to Holland to garner a point any which way they could. Holland gave Hannes Halldórsson far too little to do, and were restricted to shots from distance by a defence which was marshalled to perfection by Ragnar Sigurdsson and which performed superlatively as a unit. Robben looked sprightly until he pulled up, Sneijder did his best but his best days are now surely behind him, and only Depay and, to a lesser extent, Narsingh and Cillesen, really made their mark for Danny Blind's team on a night to forget for the hosts. It was hardly the way Blind would have wanted to begin his career as Netherlands manager. On the other hand, this was the night when Icelandic football, at international level at least, can be said to have come of age. The management duo of Lars Lagerback and Heimir Hallgrimsson have moulded a team of some quality who fully deserved the win on the night and who, to pull a football cliché out of the bag, play for the shirt. The entire team gained a collective five stars for their overall performance, but Birkir Bjarnason was, in the eyes of your correspondent anyway, man of the match; he pulled the strings in midfield and was a bundle of energy throughout the ninety minutes, rampaging through midfield one moment, helping out his defence the next, and then suddenly appearing in the last third of the pitch. The victory meant that Iceland only needed a point to qualify for their maiden major final tournament, which they achieved three days later thanks to a nervy, dull 0:0 draw at home to Kazakhstan. Captain Áron Gunnarsson will probably miss the first match of Euro 2016 thanks to his second yellow card of the game, which he received in the last minute of normal time. That did not, however, dilute the celebrations amongst the Icelandic support at a packed Laugardalsvöllur as the point gained ensured that third-placed Turkey could not overhaul them in the standings. Joining Iceland at Euro 2016 from Group A are the Czech Republic, who won 2:1 away to Latvia the same evening. For the Netherlands, though, worrying times lie ahead; they have been poor throughout the entire campaign, and prior to the match against Turkey had only won a single point in the matches up to that point against the Turks, Iceland and the Czech Republic. In front of a packed house in Konya, they looked for most of the match like a team which had completely lost its way, and meekly went down to a 3:0 defeat and fourth place in the group table. 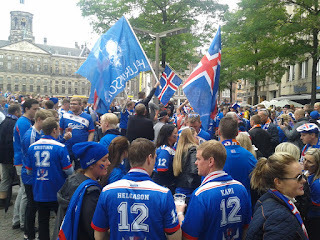 The Icelandic team and their supporters celebrate as one; will we see more of the same during Euro 2016? That will no longer concern Iceland, who conclude their programme with a home match against Latvia on 10/10/15 and a match away to Turkey three days later. A win against the Latvians will more or less guarantee top spot thanks to a superior goal-difference over the Czech Republic, who also face the Turks before heading to Amsterdam for their final match against the Netherlands, two games which will also help determine who finishes top, but who ends up in third place in the group and so be in line for a play-off spot. Iceland's qualification will surely turn out to be a shot in the arm for domestic football, which is already the most popular sport in the country amongst both males and females but is still weak in comparison to most of the rest of Europe. The women's team qualified for the 2013 Women's Euros and reached the quarter-finals; it would be a surprise if the men's team were able to emulate that feat, but with Messrs Lagerback and Hallgrimsson at the helm, this possibility should not be discounted. The team have already achieved much over the past few years, losing out in the 2014 World Cup play-offs to Croatia and now qualifying for Euro 2016. It will be interesting to see what the near future will bring. One thing's for sure: Iceland fully deserve their place at the big table of European football and they - and their supporters - will surely do the continent's lesser lights proud. The Falkland Islands men's national team recently returned from Jersey where they will be took part in the 2015 NatWest Island Games, which ran from 28/06/15-03/07/15. The team played four matches, and managed to defeat Hitra 2:1 in their opening game to retain the Small Islands trophy. Although the Falklands team lost their three remaining matches, they fought bravely and were by no means outclassed, losing 3:0 against the Isle of Wight and conceding five without reply against the Shetland Islands before losing the 11th-place play-off against the Western Isles by the odd goal in three. Team coach Michael Betts was extremely positive in his summing-up of the team's performance in Jersey, and was full of praise for his team: "The Falkland Islands football team’s performance in Jersey at the Island Games has been considered a success. Retaining the Small Islands Cup and receiving a Gold Certificate for the team’s performance are the more obvious signs of success, but the biggest success is the introduction of a new generation of players. "Aiden Morris, Ross Peters, Sam Toolan and Declan Bonner all showed at their first Island Games that they can play at a much higher standard, which only bodes well for the future. The team also introduced Paul Zeller and Alejandro Santana, both of which contributed massively to the team. "There was a fear that the new generation of players might not be able to adjust to playing against higher calibre opposition, but this proved to be unfounded. The results in Jersey proved this, with the win over Hitra and with the Isle of Wight struggling to keep the Falklands team at bay in the second half. The hope is that we build on this performance and try and do better in Gotland." "There were plenty of standout performers in Jersey: Danny Biggs, risking serious injury, played two 90 minute matches with a fractured cheekbone, which didn’t negatively affect his tenacious tackling and work rate; Paul Zeller with his tireless running; Captain Kyle Biggs with his determined performances Josh Peck with his versatility, playing at full back and centre back; Stevie Aldridge for his work rate and adaptability; and Georgie Elbakidze for his astute team selections and substitutions, with the latter changing the games against Hitra and the Western Isles." Domestically, the Falkland Islands Football League, which runs football in the islands, has been unable to run a full-scale local league competition since 2013 due to the lack of a decent playing surface, but they have been able to keep football alive in the islands by organising friendlies for Stanley FC and by running small 7-a-side league and cup competitions. Due to the current, dormant, state of the 11-a-side version in the Falklands, Stanley FC, which now more or less doubles as the national team, are currently the only official 11-a-side club currently operating in the islands. Four teams participated in both 7-a-side competitions during the 2014-15 season: FIDF (Falkland Islands Defence Force), Malvina, Sealed PR and Falkland Holidays. FIDF started the season badly, losing their first three matches, but won the next six in a row to beat Malvina to the league title on goal difference. The two teams met in the final of the cup competition, and Malvina picked up the trophy following a close five-goal encounter. As alluded to in a previous article previewing the Falkland Islands team's participation in the 2015 NatWest Island Games, there have been ongoing discussions between the FIFL and the Falkland Islands' Legislature Assembly regarding the installation of a new football pitch in the islands' capital, Stanley. A working group was set up to look into the feasibility of providing said playing surface, and Betts provided the following update on the situation. "The working group tasked into looking at new facilities is currently drafting a paper to go to Executive Council sometime this year. The working group have identified two options for new facilities; (1) develop an artificial turf football pitch to be constructed on the current football pitch, or (2) develop a much larger indoor facility that will house a multi-use artificial turf (full sized football) pitch, with numerous suitable locations around Stanley identified. "The former would be ideal for football in the islands and the latter’s suitability for football is very much dependent on the turf that is selected. [Stanley] Football Club is working hard to ensure the turf selected allows players to wear studs and that it is close to replicating natural turf. Also, the first option can be carried out with the current budget allocated, while the second option requires much more funding. The purpose of this Executive Council paper is to gauge the appetite of Members of Legislative Assembly for providing more funding to go with the large indoor facility which could accommodate many more sports." The future of football in the Falklands depends on either project coming to fruition, but following the islands' men's team's encouraging showing in Jersey the under-age team's performance in a tournament in Chile last year and an increase in football's popularity among the islands' youth, the FIFL should be able to provide enough evidence to the Legislative Assembly for them to approve the installation of a football pitch of a decent standard, which would provide both an alternative sporting outlet for Falklanders of all ages (to that of cricket, for example) and a base which will ensure that football will not only survive, but flourish, on the islands. Please find below a brief statistical overview of both the league and cup competitions run by the Falkland Islands Footbal League (FIFL), and also information on friendly matches played by Stanley FC over the same time-frame and up to the team's departure for Jersey. Kindly note, however, that the information may be incomplete, so apologies in advance to those of a statistical bent. AUTHOR'S NOTE: Many thanks to Michael Betts for his assistance and for providing the majority of the information included above; some of the information also came from the FIFL's Facebook page, and the Penguin News website was also checked, as was the website for the 2015 NatWest Island Games. Any errors or omissions shall be rectified upon receipt of the correct information. 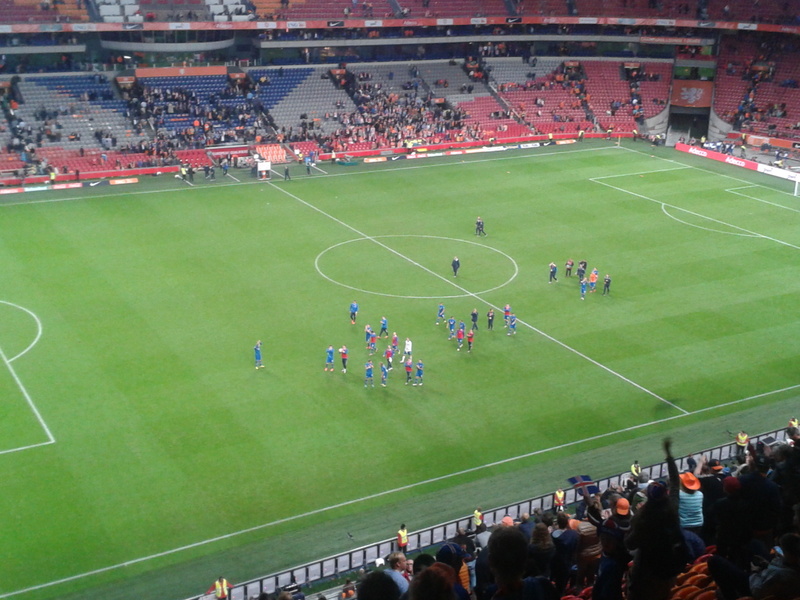 Thursday 3/9/15 was a red-letter day in the annals of Icelandic football, when they defeated The Netherlands 1:0 in Amsterdam. It was possibly the day when men's football in the country truly came of age. 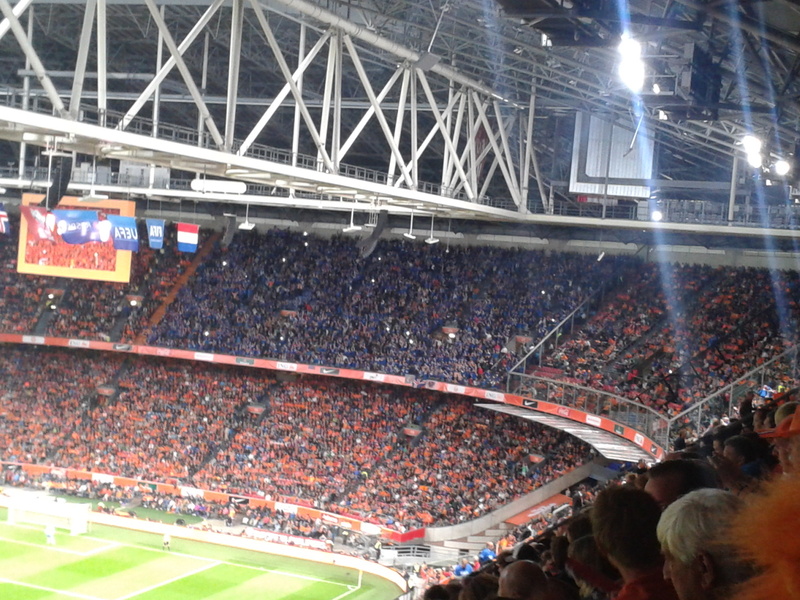 A record number of Icelandic supporters, estimated at some 3000, made the journey from their homeland (and across Europe) to the Amsterdam ArenA to cheer on their side and, like their team, left an outstanding impression, not least on your correspondent. Hundreds, perhaps more than a thousand, of them, congregated in the bars around Amsterdam's Dam square where the Tólfan supporters' club had made their base. 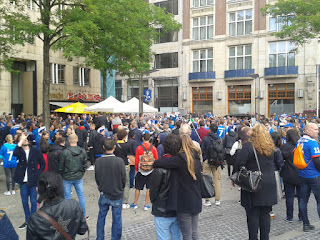 Dutch supporters were also in evidence, but the away fans had turned that part of Amsterdam blue, much to the bemusement of many a tourist hell-bent on sampling some of the Dutch city's other delights. Many of the supporters, although, hopeful, were also looking towards the game with some apprehension. Geir Þórhallsson, a KR supporter and physiotherapist living in Brussels, said that it was going to be a hard game for Iceland "as the Dutch team are looking for a win for their new coach, but if we get a draw, that would be like a big win for Iceland. I can't wait for it and I hope we get a good result." The final three games, he continued, were winnable, but that the last three games "were still going to be tricky, because when Iceland need to win, they don't do so well; they underestimate the other team. I'm hoping that the experience [the team were garnering] will change our history." Geir named Gylfi Sigurðsson and goalkeeper Hannes Haldórsson as the two best Icelandic players during the campaign thus far, and was upbeat about Icelandic football, domestically speaking. "It's now at its peak [it has never beeen so good] from its very beginning]. We started building indoor pitches twenty years ago, so now it's booming. The kids have been playing football indoors for twenty years, professionals are playing in Europe, I'm pretty optimistic about the future and I'm glad to be an Icelandic supporter today!" Víkingur supporter Árni Birgisson was the only Icelander in a group of four accosted by yours truly, and he was hoping for "a boring 0:0 draw, a point for Iceland would be like a victory for us. 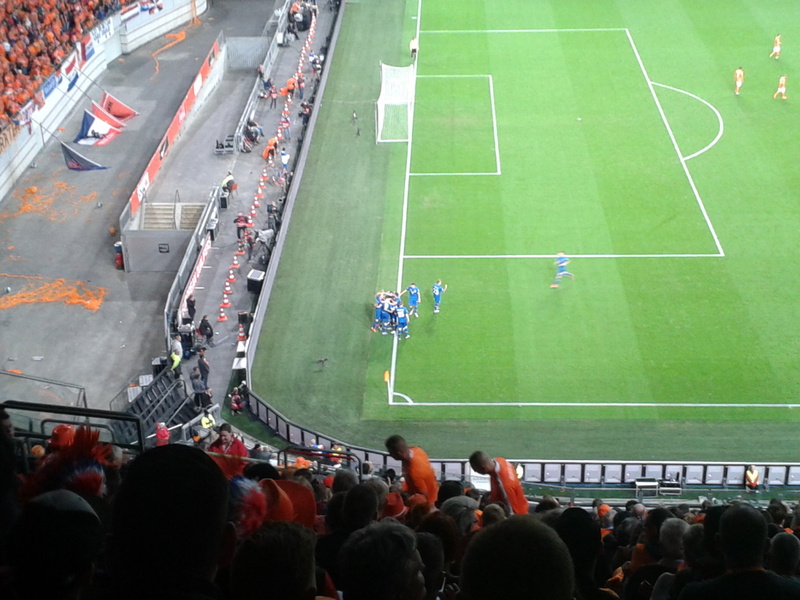 But, to be realistic, Holland will win 2:0, even 3:0. I will hope for the best, and [should they lose against Holland but beat both Kazakhstan and Latvia at home] will probably be the top third-placed team. If Holland or the Czech Republic lose just one point somewhere, Iceland will be in France next year. One point for Iceland tonight would be fantastic." "Gýlfi Sigurðsson is our most important player, but also Kolbeinn Sigþórsson, who was playing in Holland [for AZ and Ajax] for quite a while. I mean, he is a natural scorer, he only needs one chance to score. They are the two most important players, but the goalkeeper and the whole defence will need to be on form as Holland will be creating opportunities." As far as football back home was concerned, he was of the opinion that the domestic league was ranked "50th in Europe, although Stjarnan almost made it through the [2014-15] Europa League qualifiers for the first time ever for Iceland. But this year, all the Icelandic teams lost quite badly. There are actually two or three clubs in Iceland who are trying to turn 100% professional, but it will be very hard in Iceland. If you are going to have a professional team, you will have to play regularly in Europe. The population of Iceland is as big as the population of the city of Coventry in England, so if you consider that, and consider that Iceland will most likely be heading to France next year, it's just amazing." The other three in the gathering were Harry from England, who hoped for an "amazing game" and was of the opinion that Holland would win 1:0, and two Dutch natives, one of whom, Maartje, cheerfully admitted her lack of footballing knowledge and hoped for an entertaining evening but feared that Oranje would lose. The other was Koen, an acquaintance of mine (talk about an unexpected meeting! 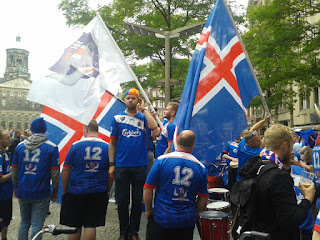 - he was just as surprised to see me as I was to see him) who, like just about everyone else standing in the Dam, was wearing his Tólfan shirt with pride; all four would be among the Icelandic contingent at the ArenA. Koen hoped that "Iceland would play well, as they have done very well in recent matches. 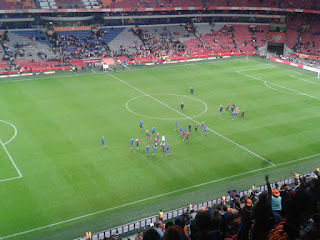 I hope that Iceland qualify for Euro 2016, but it would be disappointing if Holland were to fail; I think we have to win. The [next game] away to Turkey will be very difficult, and if we are to qualify, we'll have to get something tonight against Iceland. That would be a good start." Hjörtur Hjartarson, former ÍA star and who, apart from playing for fourth division Augnablik, currently works for Icelandic radio and television, was as articulate with his views on the forthcoming match as he was immaculately dressed. Speaking inside Tólfan's unofficial HQ, the Europub, Hjartarson said: "The current team is the best that Iceland has ever had, and [outstrips every previous] team by miles. It has to be said that the chances the team has tonight are fairly slim. We will be up against one of the best footballing countries in Europe, and although we've being doing well for the last two years or thereabouts, we have to realise we're playing Holland away. Iceland is still Iceland, and Holland don't often lose at home, whether they play against Germany, England or Iceland. So, I have to predict that our chances of winning are fairly slim." He was more than happy with the way the group had panned out so far for Iceland. "It's beyond all our wildest dreams how the group has gone, I mean, with four games left in the group, we have a five-point cushion on Holland. We are top of the group, we've scored the most goals in the group and conceded the fewest, so obviously - at this point in time - Iceland are the best team in the group. With that said, we have to win at home against Kazakhstan and Latvia, and get a point away to Turkey, and we're in France. "It may even be enough for us to win our last two home games, so the chance is there and we just have to take it. We cannot slip up in our last two home games; we have to stay focused, win those two matches and go to Turkey without the need of a win." Hjörtur was frank about who might make the difference at the ArenA: "I think the two midfielders, Gylfi (Sigurðsson) and Aron (Gudmundsson), the captain, if they can stay in shape and be as good defensively as they have been throughout this competition, as well as being aggressive when they attack, that will be key. The four backs will do their jobs as always, but these are the two key players that we need, both defensively and in attack. If they have an off-day, it will be a very difficult game." Reykjavík club Víkingur director Harald Haraldsson was amazed by the level of support which had accompanied the team to Amsterdam, but was cautious about the match against Holland. 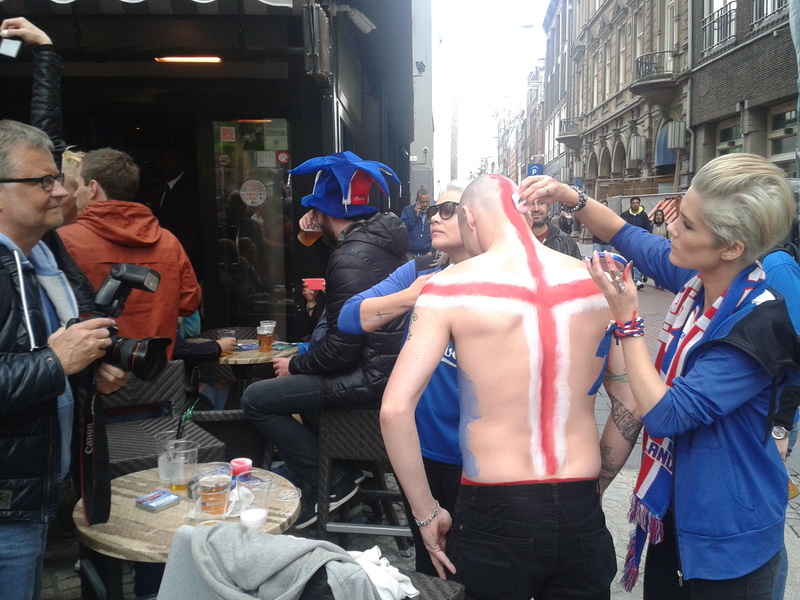 "It's just fantastic to see all the Icelandic supporters here. It's the biggest support for an Iceland away match; it's fantastic. I'm surprised by the amount of fans, but the team has been doing very well, and you can see the result of that. "The match is going to be very difficult for us. I know that the coaches will be setting up the game very defensively, but hopefully we'll get a draw. Anything else would be the biggest surprise ever. If you look at the bigger picture, this match [against Holland] is not the biggest match for us, but the next match against Kazakhstan at home; that's the biggest one. We then play Latvia at home, and that's six points we will have to get to qualify, that's for sure. Harald concluded by saying: "I'm not sure [we'll qualify if we win them] as we have to look at other games as well, but of course it wil help us a lot. We need to win them, that's for sure. But tonight, hopefully Kolbeinn Sigþórsson, who grew up playing for Víkingur, will make a difference." Interviewing done, it was off for a quick sample or two of the local brew (€6.00 for a 400 ml glass of Bavaria in the Europub, and a whopping €8.70 for the same in the neighbouring Majestic) and a quick chat with a few stragglers before heading in the direction of the Amsterdam ArenA and the match which would, should the result go their way, bring the Icelandic football team one step closer to the promised land of qualification for Euro 2016. AUTHOR'S NOTE: Many thanks to all of the above good people for their time (and patience), to Kristinn from Tólfan and to everyone who assisted in any way. Thanks to those, too, from both camps who were full of good humour and chat and who helped make the afternoon just that bit more pleasant. More from both Harald Haraldsson and Hjörtur Hjartarsson in due course.